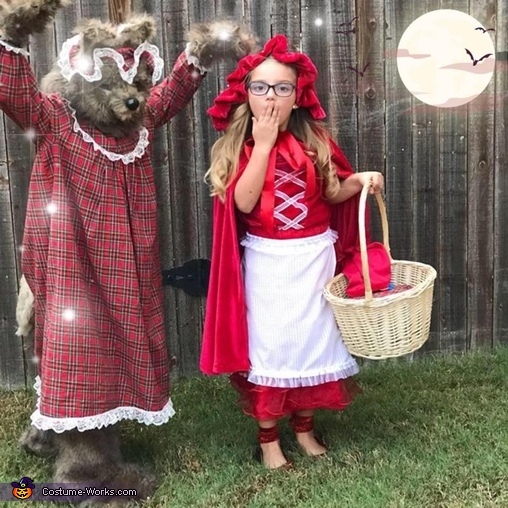 Addilyn is wearing the Wolf costume and Isabelle is Little Red Riding Hood. Little red was sew using a pattern with many alteration to the pattern. The dress underneath has ruffles on the bottom and also off the shoulder sleeves. The apron was a very like linen material with the flare of a white ruffle on the top and bottom. The hood is made of a beautiful velvet, giving it the perfect hooded cape look. The Big Bad wolf was made from many elements. The Mask is mostly fur but worn like a hat. The nose has some foam to help protude like the wolf, the black now is made of clay. The legs were legging we covered with fur and the feet were made with foam around tennis shoes with fur also. Then stuffed with stuffing creating a foot like appearance. the tale was also make with the fur and stuffed. The cloves were basic black cloves with fur attached to them and glued. The Makes was the most difficult piece to make but everything was glued together with a reinforced plastic strips on the inside. To give it the appearance of the grandma I added the night gown I made of flannel with the night cap, with a little detail of lace. In Little Reds basket I used scrap pieces of grandmas night gown to kind of tie the costumes together. Little Red's costume is finished up with little red sparkly shoes. I had so much fun making this costume, and I am so excited to share it! !